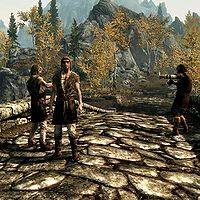 The Revelers are three happily-intoxicated Nord farmers you may meet at random locations while traveling the roads of Skyrim. All three wear random farm clothes, carry two bottles of Honningbrew Mead, and immediately invite you to join the party. As you approach, one of them will seek you out and greet you: "Hail, friend! It's good to see another merry soul enjoying this fine day. Ah, but you look tired. Come, share a bottle of Honningbrew Mead with me!" When you ask him to elaborate on Honningbrew Mead, he will provide a passionate description: "You've never had a taste of sweet Honningbrew? Why, it's only the finest mead outside of Sovngarde! Its sweetness is like a fair maiden's kiss on a starry night. And it's got enough kick to put a frost troll on his hind quarters! Ha! But enough talk. Come! Won't you share a drink with me and my companions?" Three options are available at this point, depending on your inventory; if you don't have any Honningbrew Mead, the Reveler will hand you a bottle with the words: "Ha, nothing like fine spirits to help raise your... well, your spirits! Cheers, my friend! May your adventures find you fame and fortune!" If you already own a bottle, and suggest that you split it with your new-found friends, he will be excited: "Ysmir's beard! You're one after my own heart. I would love another bottle. This good deed should not go unrewarded. Here, take this!" He will then hand you a Charmed Necklace. However, if you only own a bottle of Black-Briar Mead, the Revelers will get angry: "Black Briar? How dare you shove that swill in my face. I'd rather drink mammoth drool!" After that insult, you will no longer be able to communicate with them: "I don't talk to people who drink that Black Briar drench." Reveler #1: "Ah, is there any way you'd rather spend the day than drinking Honningbrew Mead?" Reveler #2: "Drink Honningbrew Mead with a wench on each arm? Ha ha!" Reveler #1: "I'd rather have two bottles of mead then [sic] two wenches, friend." Reveler #1: "The meads won't argue your ear off about which one should go first!" Reveler #2: "Ha! Too true, my friend. Too true..."
If they are not killed by a hostile NPC or creature, they can sometimes be found working as laborers at one of the settlements near to where you encounter them. If you don't have any Honningbrew Mead on you and you are quick (and you don't mind pickpocketing) you can sneak up to a Reveler and pickpocket a bottle. You must do this before the NPC approaches and engages you in conversation. Then when the NPC engages you in conversation you have a bottle to swap for the necklace. Any attempt at using magic on the Revelers, even healing magic, results in them turning hostile. However they will not chase you very far. Although the dialogue implies you give your Honningbrew mead away when you share it, if you choose to share with them and are rewarded with the necklace, you don't. Instead, you end up with both your mead and the necklace. The wilderness encounter "Drinking Companions" does not properly unload them from the game when you leave the area.